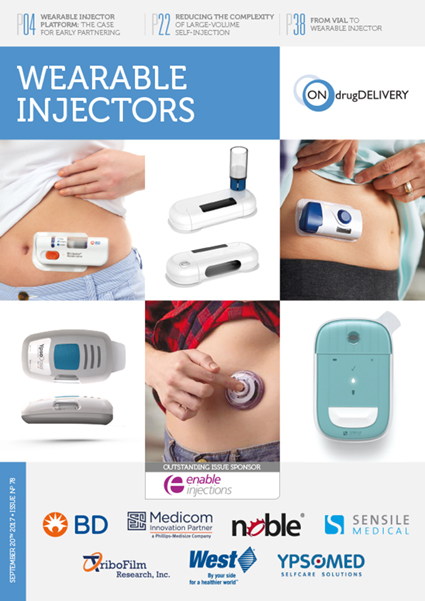 New Paper by TriboFilm research scientists published in OnDrug Delivery's September 2017 special issue: Wearable Injectors. Insulin pump therapy is considered the gold standard of care for insulin-requiring diabetic patients. An insulin pump provides glucose control by subcutaneously delivering fast acting insulin to the patient in a programmed sequence that mimics the pancreas. In addition to the clinical benefits of glucose control, insulin pumps can improve the quality of life for patients with diabetes by eliminating the need for multiple daily insulin injections. This study examines how improving the frictional properties of pump components, particularly the lubricant in the insulin container-closure system, impacts infusion pump response time and leads to superior pump operation. The FDA recently approved the first "artificial pancreas" for diabetes treatment, which wirelessly links an insulin pump to a glucose monitor using a closed-loop control system. To achieve closed-loop control, the insulin pump must accurately deliver the dose requested by the control unit on short time scales. Accurate dose delivery becomes problematic when the device flow rate changes throughout the day – such as when mimicking a healthy pancreas that reacts rapidly and precisely to changing amounts of glucose in the blood stream. Rapid infusion start-up and precise delivery at low infusion rates are critical to ensure patient safety and maintain the integrity of the feedback control. The current insulin reservoir lubrication methods and testing standards used to evaluate pump operation are insufficient for these new delivery devices. 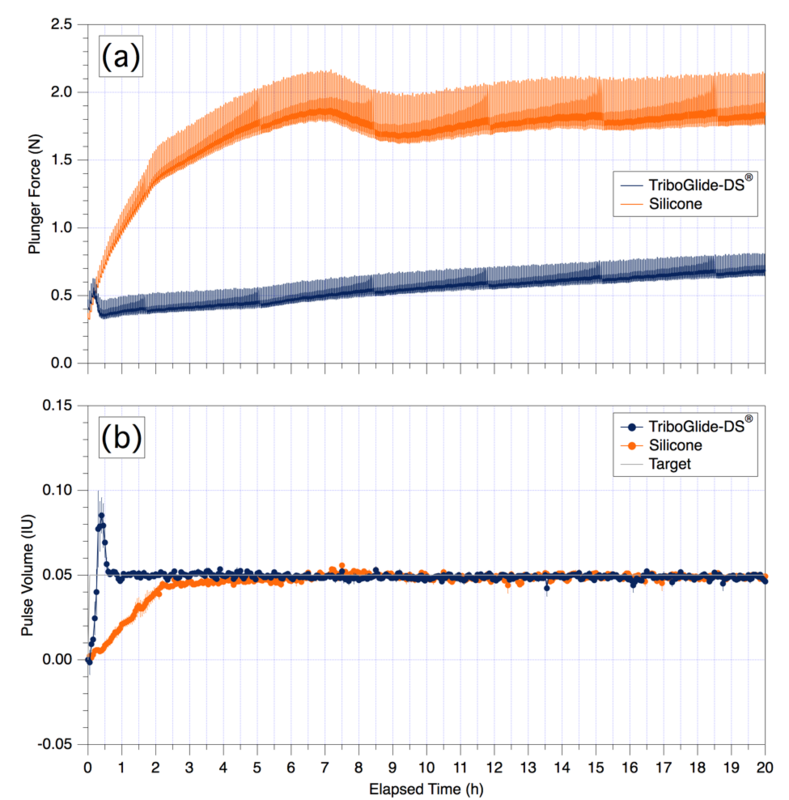 Thus, a next-generation lubricant coating and test setup were used to evaluate the dose accuracy of a pump using a realistic insulin delivery profile. Most insulin infusion pumps use a container closure system, which consists of a 3mL plastic or glass cartridge that is filled with insulin and sealed using an elastomer plunger. The pump drive mechanism pushes the plunger to deliver insulin to the patient through a subcutaneous cannula. Insulin is delivered in small, discrete pulses, where the volume of each pulse and the time between pulses dictates the time-averaged insulin infusion rate. The container closure system must be lubricated to ensure proper movement of the plunger through the cartridge. Lubrication is usually an afterthought when drug delivery systems are designed. However, the lubricant is an integral system component that facilitates the movement of the plunger through the barrel of an insulin reservoir. Silicone oil, the most commonly used lubricant, can easily be displaced under the compressive loads exerted by the slow-moving plunger. 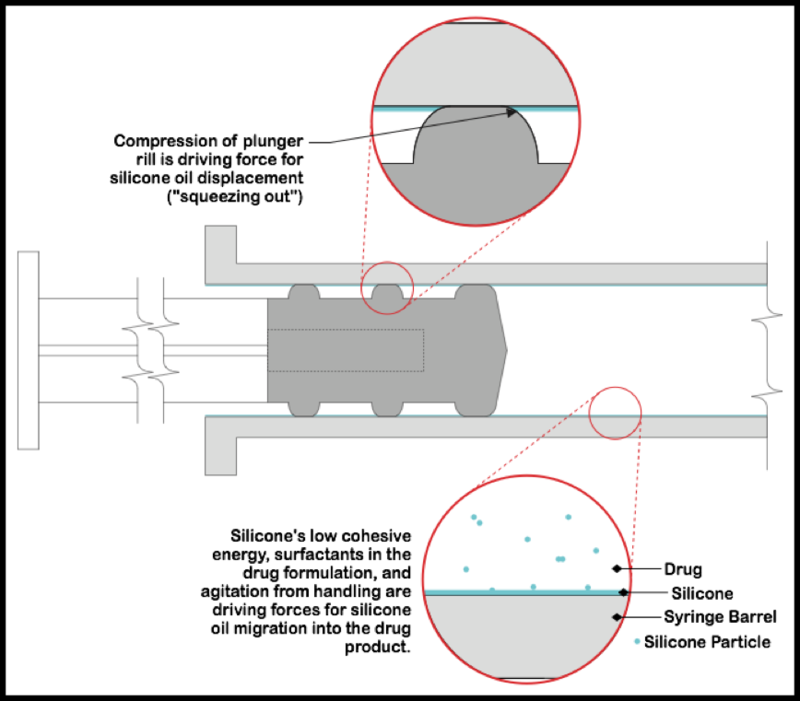 The displacement of silicone oil leads to "stick-slip" plunger movement, dosage inaccuracies due to plunger compression, and sub-visible lubricant particles in the drug medium, see Figure 1. Figure 1: Silicone oil, the most commonly used pharmaceutical container lubricant, can easily be displaced by the plunger leading to stick-slip. 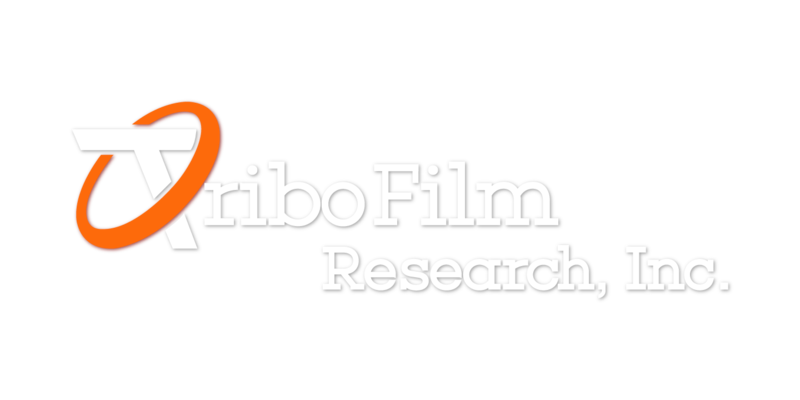 TriboFilm Research, Inc. has developed a unique atmospheric gas plasma technology that immobilizes a lubricant onto the surface of a drug container. This immobilization prevents the lubricant layer from being displaced by the plunger seals and maintains a stable, low-friction surface for the plunger to glide along. 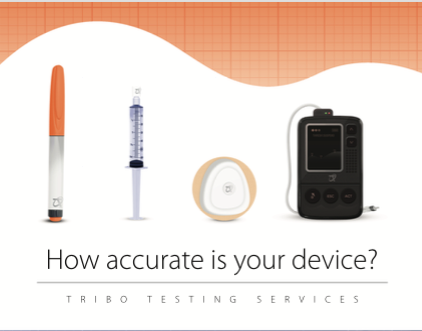 TriboFilm’s technology – originally developed under a grant from the US NIH for prefilled syringes – has shown huge improvements over traditional silicone oil lubricants in syringe force profiles as well as reduction in sub-visible lubricant particles in the drug medium. Given the success of this lubricant coating in prefilled syringes, an insulin pump manufacturer asked if the coating could improve pump performance. A Zwick universal testing machine was used as the pump drive mechanism, which also measured the force required to advance the syringe plunger. The syringes were filled with purified water to represent insulin, and attached to a time-stamped microbalance using an infusion tube and cannula. Water was dispensed through the tubing and into a beaker on the microbalance with a thin film of paraffin oil on top to prevent evaporation of the water. Weight readings were recorded every 10 seconds so that pulse-to-pulse variability could be analyzed. A schematic of this test setup is shown in Figure 2. 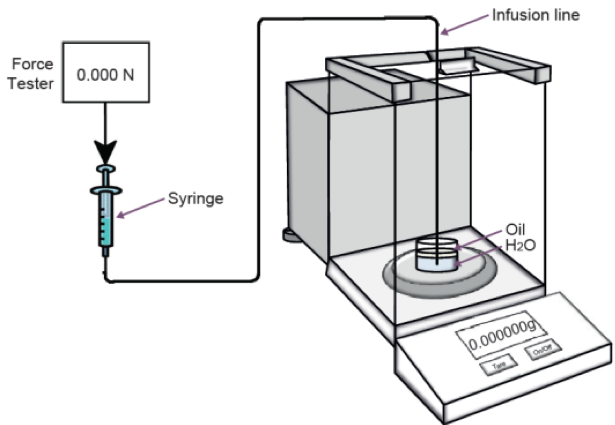 Figure 2: Test setup for making Plunger Force and Dose Accuracy measurements. Currently, insulin pump manufacturers specify ±5% delivery accuracy using methods established in the international standard EN 60601‑2‑24. The standard calls for a 24-hour stabilization period followed by the measurement and averaging of 100 consecutive pulse deliveries. Averaging over many pulses after a 24-hour stability period provides limited information about the initial pump startup and the accuracy of the individual pulses; both of which have become increasingly important as the industry moves toward an artificial pancreas. Thus, the EN 60601‑2‑24 standard may provide misleading results for an insulin infusion pump. Nevertheless, the EN 60601-2-24 standard is referenced by all pump manufacturers and was utilized during the initial phase of this study. Most insulin infusion pumps deliver their constant basal doses by pumping discrete pulses of 0.01 to 0.1 Insulin Units (IU) every 2 to 6 minutes. For this study, a constant pumping speed of 1 IU/hour was achieved by delivering 0.05 IU pulses (15.8µm plunger movement) every 3 minutes. This dose was delivered constantly over a 20-hour period while concurrently measuring the force required to advance the plunger and the weight of fluid dispensed. · The average force for silicone oil lubricated syringes was 300% higher than the average force for TriboGlide-DS® lubricated syringes. · The TriboGlide-DS® lubricated syringes reach an equilibrium force level and corresponding target delivery volume within 30 minutes, while the silicone oil lubricated syringes required 150 minutes to reach the target pulse delivery of 0.05 IU. Additionally, the force required to advance the plunger in silicone oil lubricated syringes remained elevated, indicating that the stress built up in the plunger seals was never released. TriboGlide-DS® lubricated syringes resulted in lower and more consistent plunger forces than standard silicone oil lubrication. Lower forces will reduce power consumption for an insulin pump which could allow for a smaller motor and battery, and ultimately a more discreet insulin pump. The results in Figure 3 are attributed to the effects of plunger compression. Whenever an elastomeric sealing member is used to dispense fluid – such as the plunger in a syringe or cartridge – there is the potential for compression of the plunger which can store unwanted stresses. A free lubricant, such as silicone oil, will be displaced from the plunger/barrel interface and the slowly advancing plunger will compress and plow through the silicone oil layer as it advances. In the case of the TriboGlide-DS® crosslinked lubricant, the coating is never completely displaced from the plunger/barrel interface and the plunger can glide on top of the lubricant layer. This is observed in the force curves where the silicone oil lubricated syringes build up force for the first two hours while the plunger is compressing, and then plow along the barrel in the compressed state. Conversely, the TriboGlide-DS® coated syringes overcome the static plunger friction and then glide at a relatively stable force level. The plunger material, durometer, and seal design can greatly influence this transition and our future work will focus on further understanding the phenomenon. Figure 3: (a) Plunger force vs. test time and (b) pulse volume vs. test time for TriboGlide-DS® and silicone oil lubricated syringes. Target pulse volume is 0.05 IU. 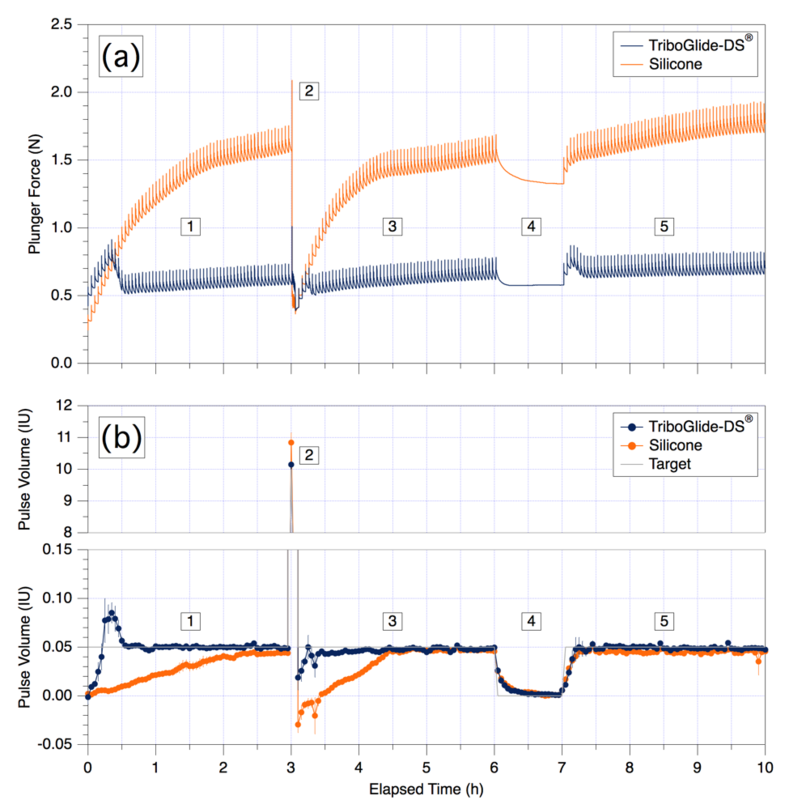 Toward the end of the 20-hour measurement sequence, both the TriboGlide‑DS® and silicone oil lubricated syringes had stable pulse volumes at the 0.05 IU target. An average of these pulse values is reported when using the EN 60601‑2‑24 standard, and both lubricant types meet the requirements of the standard. However, an insulin pump is required to deliver several bolus doses during the day based on the needs of the user, along with extended periods of basal delivery, and complete pump shut-off in emergencies – and thus never experiences a 24-hour stabilization phase. The next logical step was to use this testing apparatus to evaluate how the two lubrication systems would behave under a realistic dosage scenario for a basal dose that is interrupted by a bolus and a pump shut-off event. As insulin pump manufacturers move toward an artificial pancreas with closed-loop control, the current testing standards must be modified to account for accurate dosage on shorter time scales. 1. A basal rate of 1 IU/hr was delivered for 3 hours by advancing the plunger in 0.05 IU steps every 3 minutes. Target pulses in this section are 0.05 IU. 2. A 10 IU mealtime bolus was delivered by advancing the plunger in 0.05 IU steps 200 times over the course of 3 minutes. The target in this section is 10 IU. 3. A second basal rate of 1 IU/hr was delivered for 3 hours, as in step 1. 4. A pump shutoff for 1 hour was performed to mimic a potential hypoglycemic event. The target in this section is 0 IU. 5. A third basal rate of 1 IU/hr was delivered for 3 hours, as in steps 1 and 3. Figure 4: (a) Plunger force vs. time and (b) individual pulse volume vs. test time for the realistic pump profile. The five different pump regions are labeled on the plot where [1, 3, and 5] correspond to basal delivery,  is a mealtime bolus, and  is a pump shutoff. 1. Basal Delivery 1: During the initial 3-hour basal phase, a similar result to the pump startup for the constant pumping tests was observed. The TriboGlide‑DS® coated syringes quickly reach a steady state within 30 minutes where the plunger force peaks and then returns to the unstressed level. The silicone oil lubricated syringes build up stress for the first 150 minutes and then continue to advance the plunger without relieving the built-up stress. The corresponding pulse delivery volumes mimic the force trends where the TriboGlide‑DS® lubricated syringes stabilize to reach the target delivery rate within 30 minutes while the silicone oil lubricated syringes require more than 2 hours. 2. Bolus Delivery: A spike in force, followed by relief of the built-up stress in the plunger is observed during the mealtime bolus. The TriboGlide‑DS® lubricated syringes require 50% less force compared to silicone oil lubricated syringes and the stress release is minimal because there was not much plunger compression. With the silicone oil lubricated syringes, all the plunger compression stress built up during the basal dose in step 1 is relieved and the plunger force returns to its pre-stressed state. This stress release and plunger decompression occur because of the significantly longer distance the plunger moves to deliver the mealtime bolus compared to the short pulses for basal delivery. The bolus volume was very accurate for the TriboGlide‑DS® lubricated syringes, while the silicone oil lubricated syringes overshot the target by about 1 IU or 10% of the bolus dose. This significant overshoot is attributed to the plunger decompressing during the longer distance the plunger traveled to deliver the bolus. 3. Basal Delivery 2: After the mealtime bolus, the basal phase continues where the TriboGlide‑DS® coated syringes remain at the steady state force observed before the bolus delivery, and the silicone oil lubricated syringes require another 2 hours to return to equilibrium. The delivery accuracy results mimic the plunger forces. 4. Pump Shut-off: A pump shutoff occurs after the second basal period for 1 hour. The plunger force for TriboGlide-DS® returns to initial levels immediately. However, the silicone oil lubricated syringes remained at a higher force level – retaining the stress in the plunger seals. This retained stress has the potential to deliver an unwanted bolus if the plunger decompresses due to an accidental mechanical shock to the pump. Both lubrication systems significantly reduced fluid output within a few minutes when the pump sequence was halted. 5. Basal Delivery 3: The third basal delivery continues for 3 hours after the pump shutoff with both syringe lubricant types remaining in the steady state of force that they were in prior to pump shutoff. The final basal dose is delivered at the 0.05 IU target very quickly for both syringe types. · The TriboGlide-DS® lubrication system significantly reduced the plunger forces compared to traditional silicone oil. Lower forces require less battery power, which can reduce the size and weight of the overall device. · A reduction in forces also allowed for significantly faster response time for the infusion pump to accurately deliver the desired dose. 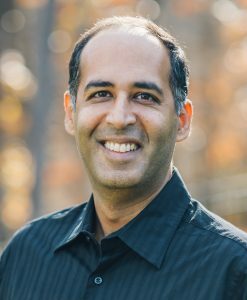 Faster response times will improve the feedback response for closed-loop artificial pancreas systems. · Higher plunger forces in silicone oil lubricated syringes led to stress buildup and compression of the plunger for hours before an equilibrium was achieved. If the pump were jarred accidentally, this stress could be released and dispense an unwanted and potentially harmful bolus to the patient. · A modification of the standard dosage accuracy test method was developed to show how realistic changes in the dosing rate throughout the day would affect the accuracy of a pump. This research shows how the TriboGlide-DS® lubrication system provides a means to continue the trend of developing smaller, smarter, and safer infusion pumps. Set up a no-obligation consultation to discuss your specific challenges with us under a strict NDA. Click the BLUE BUTTON BELOW to view our calendar availability and set up a time that works best for you. You will receive an email confirming your call with us.